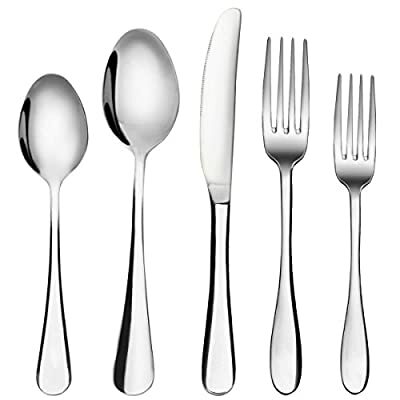 ✔ MODERN 18/10 FLATWARE SETS 20 PIECES: 4 piece Dinner Knife, 4 piece Dinner Spoon,4 piece Dinner Fork, 4 piece Salad Fork, 4 piece Salad Spoon,1 piece Gift Box. 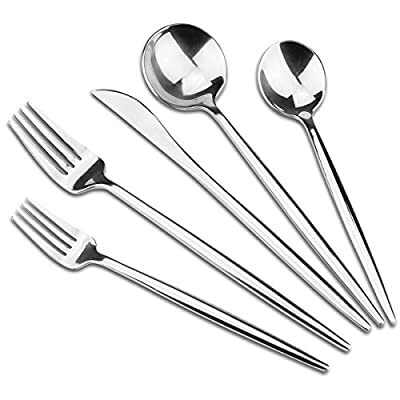 ✔ HAND FORGED SILVERWARE SET: Crafted from 18/10 stainless steel, Heavy Solid Silverware Sets, rust proof, high hardness silverware knives set. 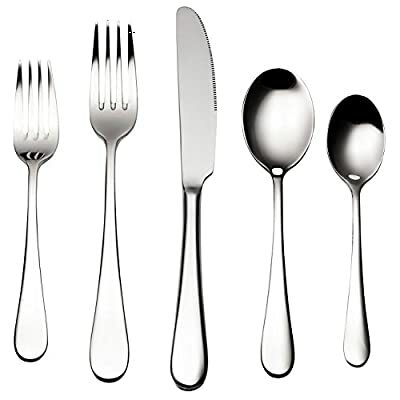 ✔ ABOUT SILVERWARE DISHWASHER SAFE: You can put the black dinnerware set in the dishwasher go through quite a few cycles in the dishwasher ,and it shines nicely each time it comes out of the dishwasher ,simple and elegant. 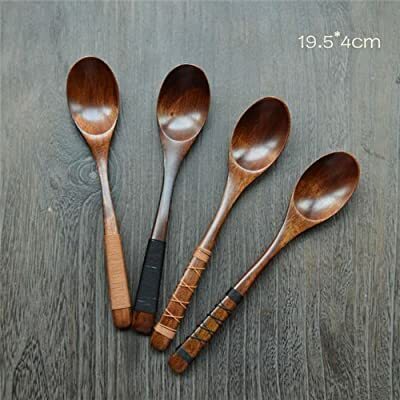 Package included: 4pcs wooden spoons. Size: length 19.5cm/7.7″,width 4cm/2″. No pollution and non-toxic. Environmental health. Perfect for travelling,camping,hiking and other outdoor activities. 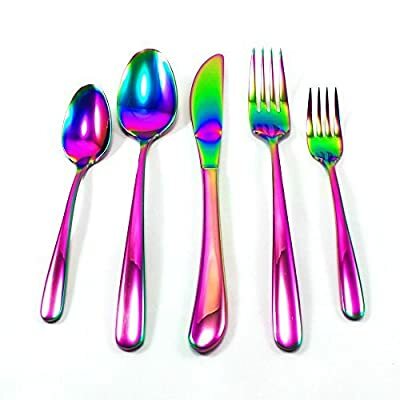 HIGH QUALITY: This Dishwasher Safe, Elegant and Colorful Flatware Set will never rust, corrode or lose its shine as it is made of 18/8 Stainless Steel, coated with a durable titanium coating. 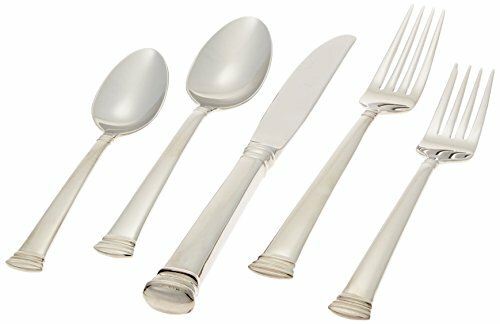 E-BOOK: You will also receive a Table Setting Guide e-Book, with lots of cool info about the history of flatware, as well as step by step, practical instructions for setting the table, folding napkins and more. 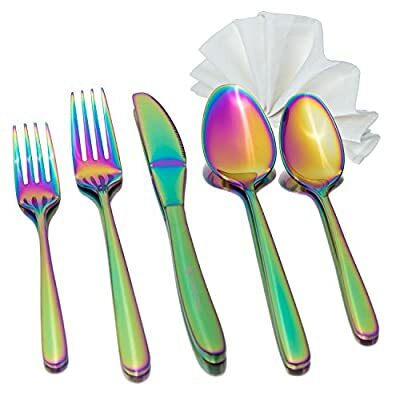 A UNIQUE GIFT IDEA: If you are looking for a nice Present Idea, this High Quality Flatware Set is definitely a best gift, including also a 100% cotton Napkin and presented in a colorful gift box. HEAVY WEIGHT: Made of heavy weight 14/0 stainless steel. 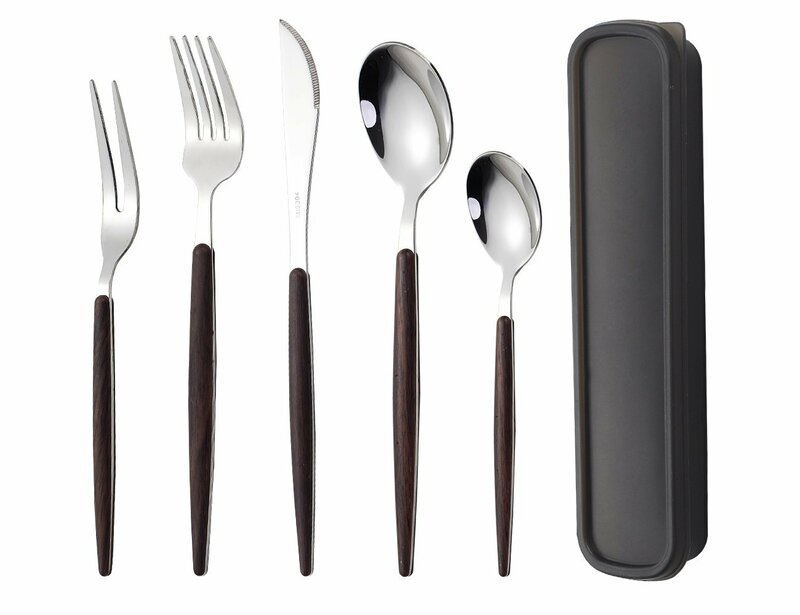 PORTABLE CUTLERY SET – includes 2 forks, 2 spoons, 1 knife,come with convenient tableware box. A very handy tool if you’re always on the go. 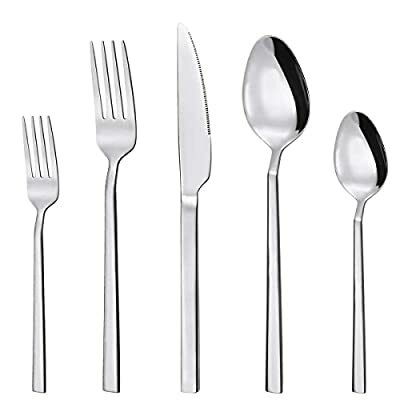 HIGH QUALITY – The reusable silverware constructed by 18/10 stainless steel and ABS plastic, mirror finished surface, smooth edge no rough spots, rust-resistant, durable and healthy. 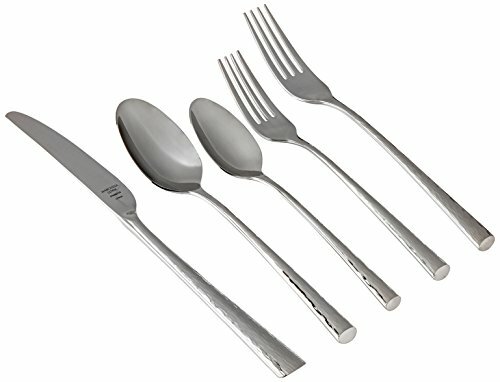 FRIENDLY DESIGN – elegant style with unique handle, proper gauge thickness and weight to hold comfortably. The compact storage container takes up very little space in your bag. The 5 pc. 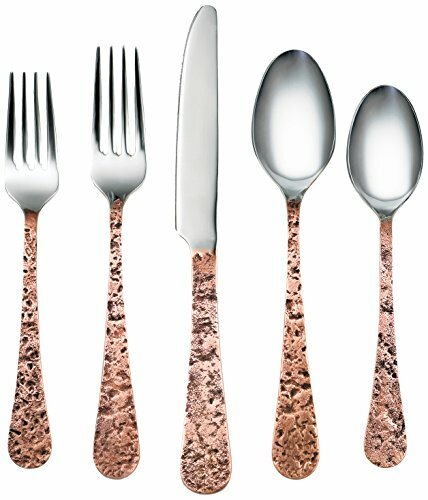 place setting consists of one each of the dinner knife, dinner fork, salad fork, place spoon and teaspoon. Contoured. Contemporary. Cool. 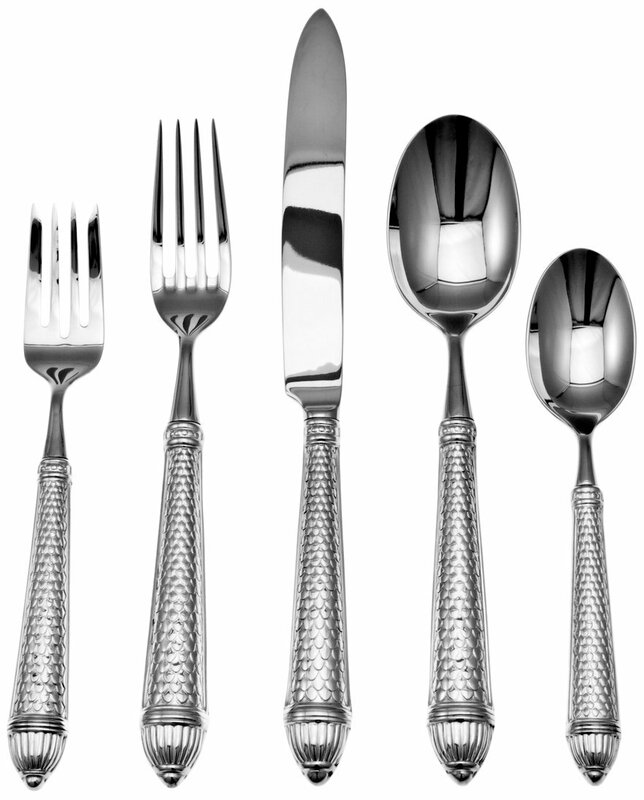 This flatware pattern was designed with shape in mind. A recessed well along the bright handle commands your attention with its contrasting satin finish. 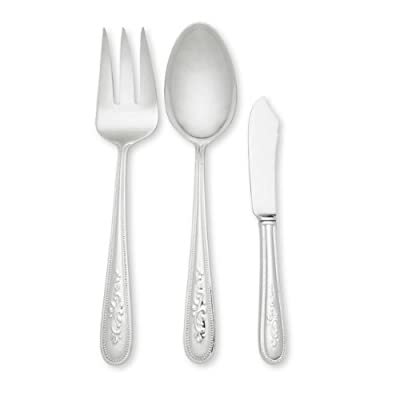 ECONOMICAL: No more having to buy cheap silverware sets multiple times a year due to scratches, blemishes, and nicks. 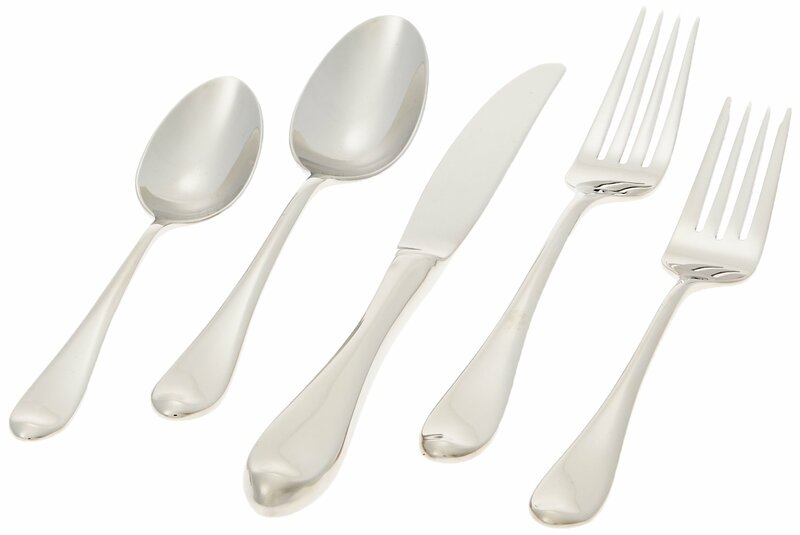 Our flatware is finished with a premium coating to maintain a scratch-resistant and polished look use after use. CONVENIENCE: Say goodbye to handwashing fragile statement pieces after entertaining guests. Not only is our novelty tableware Dish Washer Safe, but also is resistant to rusting and corrosion. 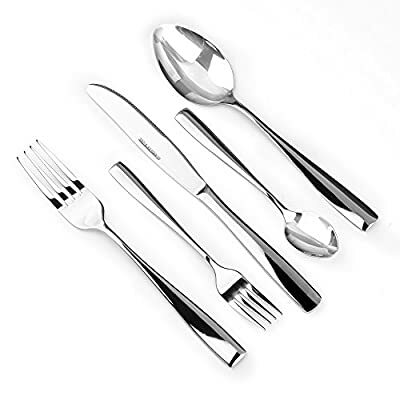 LUXURY EXPERIENCE: Forged out of only the most superior 18/8 stainless steel, the heavy-set silverware combines with ergonomically shaped curves and well-balanced dimensions to provide the ultimate dining experience. Bright. Bubbly. Bold. Playful polka dots in a soft brushed finish pop against Cirque’s reflective square handle. 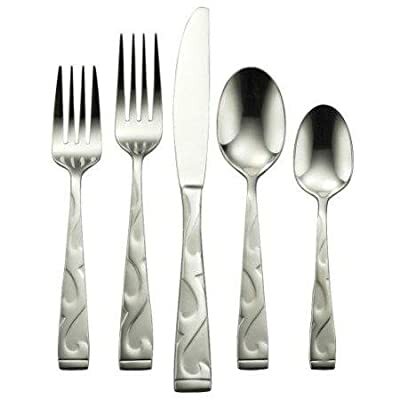 This geometric design is crafted in fine stainless steel for a lifetime of beautiful service. Made of High Quality 18/0 Stainless Steel with two-tone finish. 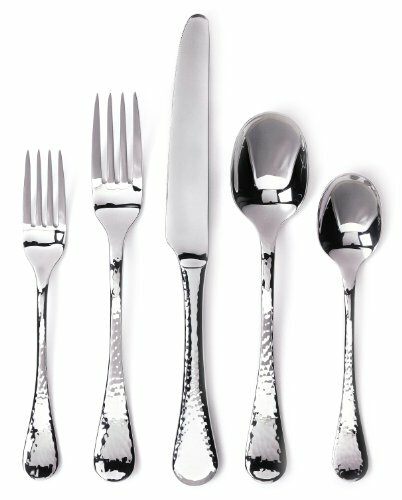 With a vision of powerful ocean waves in mind, we crafted our distinctive Aquarius line of flatware. The aesthetically-pleasing design twists and flows through the handle with grace and elegance. 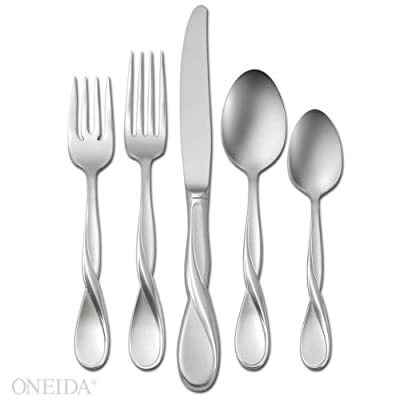 Oneida’s 18/10 fine flatware combines genius design along with durable materials that will last a lifetime. 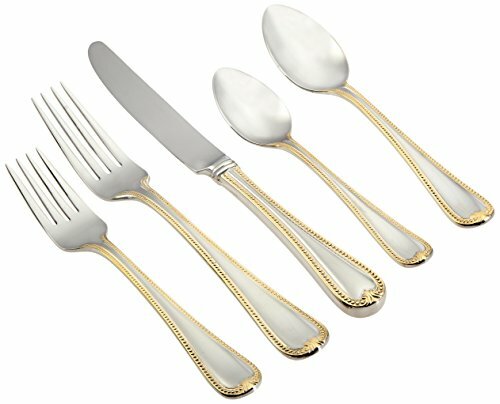 20-piece flatware set, service for 4; includes 4 salad forks, 4 dinner forks, 4 teaspoons, 4 dinner spoons, and 4 dinner knives. 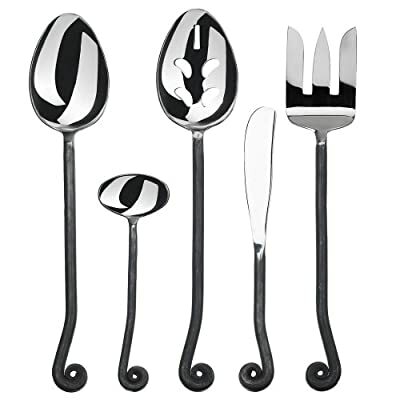 SERVICE FOR 4 – The Utensil Sets come with 4 Dinner Knifes, 4 Dinner Forks, 4 Dinner Spoons, 4 Salad/Dessert Forks, 4 Teaspoons. 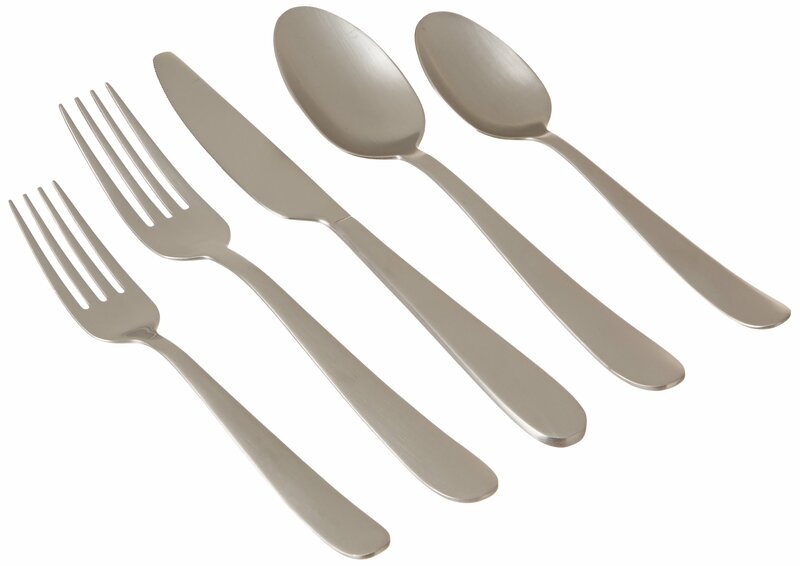 HIGH QUALITY – Forged from 18/10 stainless steel, the proper thickness and weight to stay comfortable. 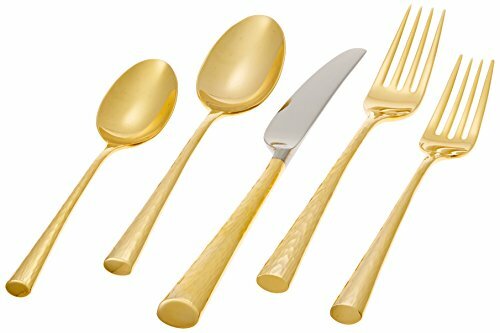 SAFE AND DURABLE – Dishwasher safe(no harsh detergents), rust and corrosion protection, keep shiny, smooth edges protect your palm.